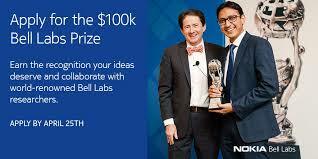 Applications are now open for the 5th annual Bell Labs Prize competition. The Nokia Bell Labs Prize is a competition for innovators around the globe that rewards 10x game-changing ideas and proposals in the general field of information and communications technologies. Bell Labs is the research arm of Nokia and one of the world’s foremost technology research organizations. The three winners may have an opportunity to work with Bell Labs, giving them the unique opportunity to collaborate with researchers to further develop the idea and enhance its commercial viability. Open to innovators from around the globe. You must be a citizen of one of these countries. You must be aged 21 or over at the time of registration on the website. Employees and applicants for employment are not eligible to participate in the Contest, but interns are. 10x Innovation Potential – How is your proposal novel – what has not been done before, what is the “out of the box” thinking that could result in a 10x change in performance (e.g. speed/throughput, distance, latency, cost, energy efficiency or simplicity)? All participants will be notified of Stage 1 results by June 1, 2018, and Stage 2 results by October 17, 2018. Stage 2 finalists will also receive feedback and comments from Bell Labs Reviewers.